Paste paper 6 or one of choice, apply your mask, delete and merge group. Paste element 45, resize to 90%, move down some. Paste element 5 below the grass layer. Paste your tube, resize to 30% and place on the grass. Paste element 8 on the right, below the grass layer, duplicate, mirror. Resize element 24 to 50%, place below the fence on the right, duplicate 3 more times, adjust to your liking. Resize element 40 to 55%, place on the left below the dog layer. Resize element 17 to 25%, place in front of the tube layer by the feet, duplicate, resize to 70%, place over by the bucket, duplicate again, mirror, move below the tube layer. Paste element 11 below the grass layer, resize to 75%. Resize element 18 to 60%, place on the left side. Resize element 14 to 75%, paste on the mask layer, duplicate, mirror. Paste element 9 above the mask layer at the upper left, duplicate, mirror, duplicate, flip, duplicate, mirror. Paste element 50 on the top layer at the upper right. Resize element 48 to 50%, place on grass on the right, duplicate a couple more times and place by the dark part of the flowers on the right, and move one down a bit more. Resize element 34 to 50%, free rotate to the left at 90, paste at the bottom above the grass layer on the left, duplicate, mirror. 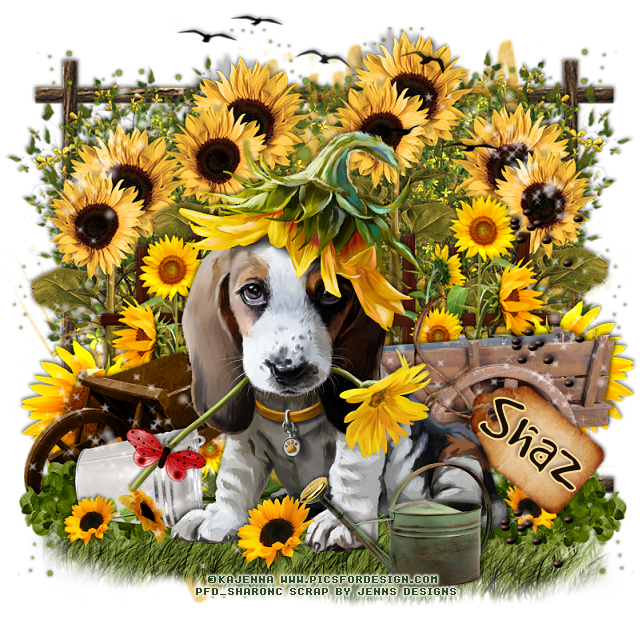 Resize element 7 to 75%, free rotate to the left at 50, paste above the wagon on the right, erase some of the string by the flowers. Resize element 22 to 50%, place in front of the tube on the right. Resize element 38 to 70%, paste below the tag layer you just pasted, duplicate, mirror. Resize element 23 to 25%, mirror, place on the stem of the flower on the tube. Paste frame 1 below the mask layer.